American Idol will premiere its final season on FOX in January, but it will be a shorter season that last. In fact, The Hollywood Reporter revealed in a new report that fans will see four less weeks of the reality competition. As it stands right now, the last American Idol will be crowned in April. Trish Kinane, president of entertainment programming for FremantleMedia North America, did not confirm the shortened season, but she did speak about the show having less episodes. The Hollywood Reporter stated in their report that the decision to cut the episode order for the series was made by FOX. 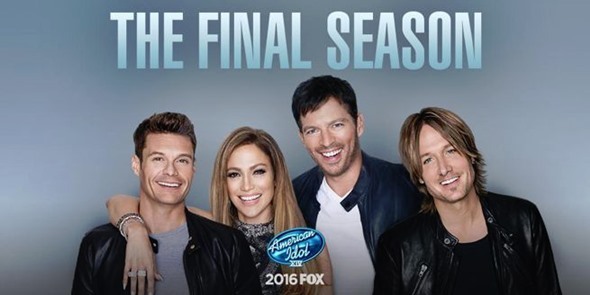 For now, FOX viewers can tune in to see the last season of American Idol starting on January 6. Jennifer Lopez, Keith Urban, and Harry Connick Jr. will take on the panel duties for the last season, and Ryan Seacreast has stayed with the series for one last season. Are you surprised that FOX cut four weeks off of American Idol? Tell us what you think. I’m sorry but that is just stupid. There is no ” it will be good if it is shorter.” There’s no future of American Idol. The last season should be the normal length so that it’s the same. They want the last season to be special, but making it shorter isn’t making it special. It doesn’t make sense and it’s stupid. American Idol has lasted 5 months – too long. The Voice is barely 4 months and other music shows in the past summers last 3 months. I’m surprised that AI was cancelled! I know not all of the winners made it big, but they do have some of the best talent that has gone on to major success. Carrie Underwood being the biggest singing star. I like to think I was a part of her success, as I voted for her week after week. To me this has been the best singing competition ever. I will miss it very much! Cut the auditions? Thats the best part of the show! (That & Hollywood week). I cant stand the later shows, watching the humble kids turn into conceited brats who do not want to listen to advice because everyone is telling them how great they are! (There have been a few exceptions through the years, however). Shorten the auditions, not the rest.